Our Main Hall is approximately 18 metres long and 10 metres wide. The floor is marked out for Badminton, Volleyball and Netball and has a sprung sports floor. There is a plenty of space for functions, parties and wedding receptions and there is a large hatchway through to our commercial kitchen to enable ease of serving. 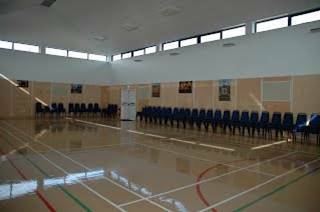 This hall benefits from under floor heating so is ideal all year round.